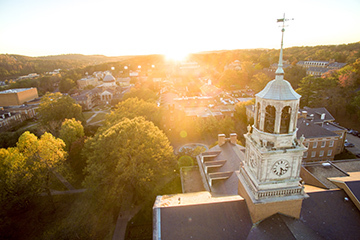 Samford University’s Division of Marketing and Communication recently won several awards in national and regional competitions. The 2014–15 Annual Report produced by the division received an Award of Excellence (first place) from the Religion Communicators Council in the annual DeRose-Hinkhose Memorial Awards. The annual report also won second place in the Wilmer C. Fields Award Competition sponsored by the Baptist Communicators Association (BCA). The #ShaunaStrong video produced by Brad Radice, director of broadcast media, and B. J. Millican, producer, won third place from BCA. A video produced for Samford’s College of Health Sciences (CHS) by 2009 alumnus Nathan Troost won first place in BCA’s audiovisual promotion video category. The video highlights some of the CHS ministries on Chandler Mountain. She also won second place in that category for her story about the pharmacy school’s research project with Children’s of Alabama and second place in the feature story-online publication category for her story about student experiences during Jan Term. This is the 10th consecutive year the division has been recognized nationally for its work.